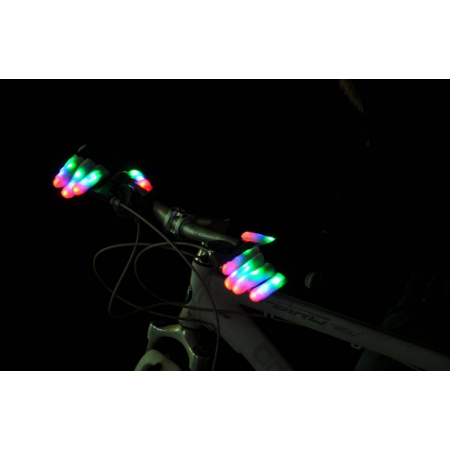 Etc Buys LED Fingertip Light Up Gloves – Magic Light Gloves with Replaceable Batteries – LED Gloves• Materials: LED flashing light gloves are manufactured using premium-grade materials that do not cause any skin irritation• Usage: luminous gloves add a colorful charm to your party ambience. Ideal for clubs, dance halls, bars, stage shows• Easy to Use: fingertip LED light can be activated simply by clicking the button on the back of the wrist• Other Information: magic LED light gloves come with replaceable coin-cell batteriesGo funky and enjoy your special occasions to the fullest with Fingertip LED gloves, which are manufactured using high-quality materials. With multiple regulation mode, you can easily adjust the light intensity of the luminous gloves. The LED flashlight gloves offer a snug fit.